The photographs of various Queensland 2' gauge sugar cane railways on pages 1 to 3 and preserved/tourist railways on pages 4 and 5, have been made available by well known Queensland based railway photographer Brian Webber. These photographs are (c) to Brian Webber 2000 - 2016. Brian has no problems with you downloading the photographs for personal use. If the photographs are to be used for any other purpose permission must be sought from Brian. Contact can be made with Brian through web manager (OzBob). Many thanks to Brian for making these photographs available. Enjoy! 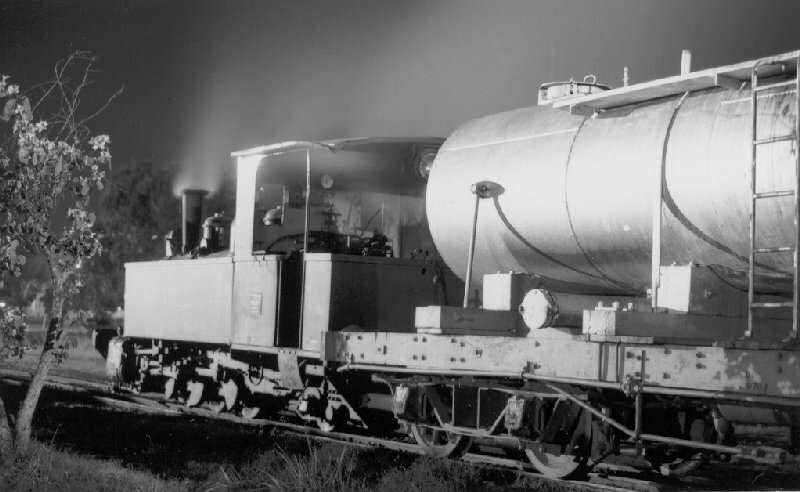 Marian Mill Perry 2'gauge with QR molasses wagon 3'6", circa 1960. (Click on thumbnail to see enlarged view). Light Railway Research Society of Australia Inc.
Visit the LRRSA web site for more information on light railways in Oz.